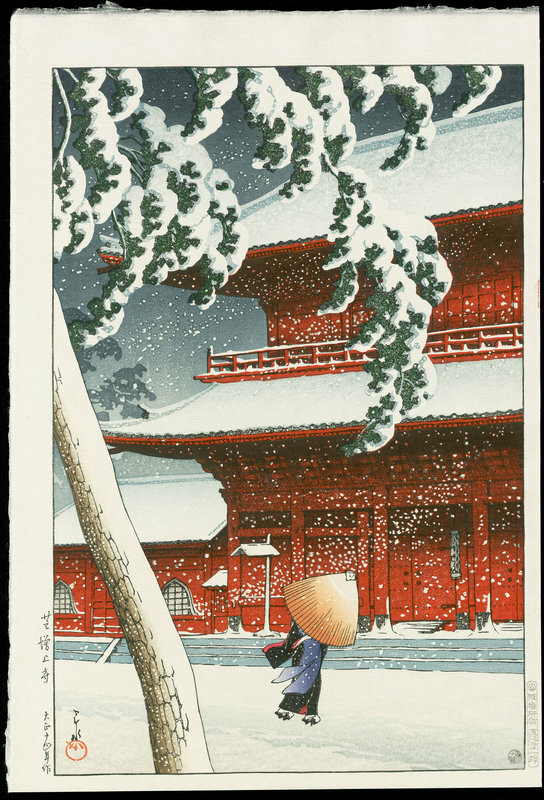 Hasui, Kawase (1883-1957) "The Zojoji Temple" - Woodblock - Chinese and Japanese woodblock prints for sale, silkscreen, scrolls, watercolor, lithographs. Artwork Details for Hasui, Kawase (1883-1957) "The Zojoji Temple"
Notes: After a hiatus of many decades Watanabe Shoichiro has recently republished Kawase Hasui's most iconic and sort-after scene, "The Zojoji Temple". Republished in a small edition size of only 100, the entire edition was sold out in only five days, of which I was only able to obtain a single copy, which is presented here. The market for this scene is such that this recent edition has sold here in Japan, at auction, for over $3,000 (see here for a list of auction results). Pre-war strikes in fine condition sell for up to $15,000, and even those in only 'fair to good' condition can sell for over $5,000. This edition has Watanabe Shoichiro's publisher seal in the light margin and a 7mm publisher seal at the lower right corner of the printed area. In perfect condition.